I offer this photo of toboggans as further proof that the Swiss national character is imbued with risk-taking in the extreme. Old-fashioned wood sleds* complete with slope-slickening metal runners to make what could be a tooth-smashing venture into a skull-crushing one are filling the stores. Ah, the Swiss. They know how to make an insurance agent take to the drink. I have not lately spent a lot of time in North American store’s children’s departments, so it is possible that the sale of wooden sleds in Canada has escaped my notice, but I believe these are no longer available there. Note the extra height of the sled, raising the centre of gravity so as to create added lift when this thing goes airborne and flips. It is said that you learn about your own culture when you are removed from it and this is true. For example, it was during our tenure in Spain that we realized Canadians and Americans are a smiley bunch. We smile at anything, anyone, anywhere at any time. To the Spanish, this made us look suspect, as though we were about to go through their pockets or perhaps ask them for directions back to the insane asylum. In Switzerland, we have learned that Canadians are crazy about safety. We block off roads when heavy-duty construction is underway. Here in our Swiss village, I’ve been able to walk a narrow path down an alley while cranes swung large department store windows a few stories above my head and backhoes dug around who knows what kinds of pipes in the ground below, only a spit away from my feet. Close a road? The Swiss wouldn’t hear of it. A block away, they have erected a heavy timbered frame over a major pedestrian thoroughfare. The frame is held in place by wedges lodged between the large posts and the concrete block’s hole. No guy wires or supportive beams are holding this thing up, and from where I stand, a stiff wind could turn this into something resembling a set on a horror movie. But there it is, unsupported, still standing and waiting for some kind of Christmas decorations to be added to it. Either that or this monstrosity is in the first construction stages of what will be a public gallows. I will keep you informed as work progresses. In the meantime, I am trying to figure out how a local apparition of a bike (see above) actually works. 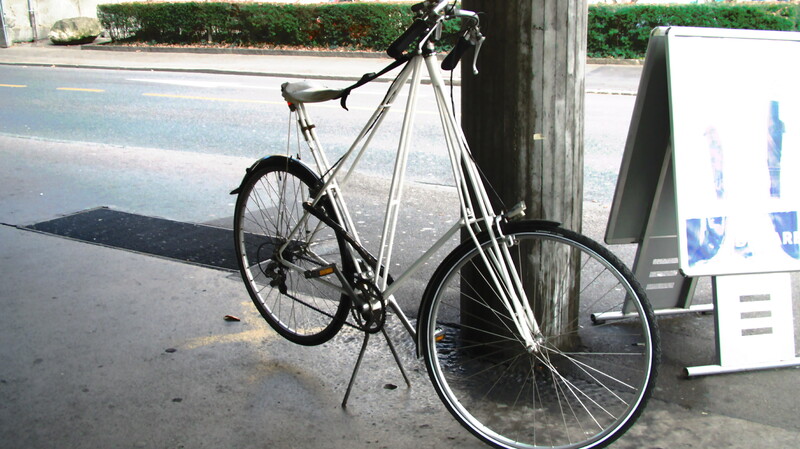 The handlebars are extremely high up and the only visible support for the seat is that it’s tethered between the post and fore-frame by a woven strap. That can’t be safe. 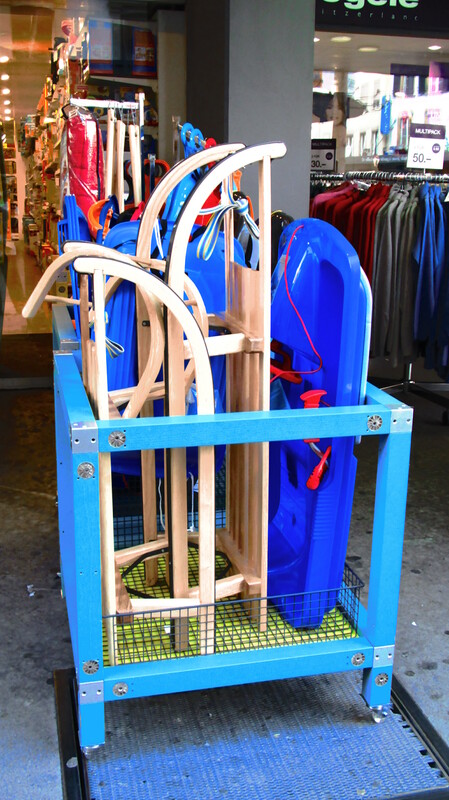 *The price tags on the wooden sleds run up into the hundreds of dollars. Possibly, this prevents the very young or foolhardy from purchasing them, although I doubt it. There are a disproportionate number of people walking our streets with leg casts, crutches and the like.